This Property Boasts The Best Panoramic View of The Gulf Of Mexico and Miles Of White Sandy Beach. Enjoy Sensational Sunsets From Your Private Balcony and The Warm Gulf Breeze. Plus Plenty Of Restaurants, Shops and Night Life Within Walking Distance. A Short Walk Will Take You To The Famous John's Pass Where You Will Find 100 Shops, Restaurants, Jet Ski's, Parasailing, Fishing and Boating. Awarded The Trip Advisor Certificate Of Excellence. The Resort Itself Has a Game Room, Shuffle Board and Large Heated Pool Directly In Front Of The Beach. Sit At The Pool and Enjoy a View Of The Open Water and White Sandy Beach. Full Time Staff On Site Daily To Assist You. Be Sure And Read Our Reviews To Hear What Our Guests Have To Say about The Condo And Area. Its The Best Hidden Secret On Treasure Island. My husband and I are native to Buffalo New York. The cold winters in Buffalo are what brought us to vacation throughout Florida when our children were younger. We liked the laid back family atmosphere of the Treasure Island area and specifically the South beach Resort. My husband also enjoys fishing and it is world class in this area. Being able to navigate the beaches with ease was a plus for us. There are times we only use our car for groceries. Being small business owners it is difficult to get away for long periods of time and being in the on site rental program was a plus for us. Customer service is very important to us as vacationers and we wanted the same great service for our guests. No punching in a code to get into the condo or having to call an answering service if you need assistance. Our staff are there daily to assist you when needed. We love the convenience and space of a condo rather than a hotel. We enjoy preparing breakfast and lunch at the condo. Not only is it a time saver but it's also budget friendly. Our family really enjoys the relaxed atmosphere of the Treasure Island beaches and area. Beach chairs, umbrella and beach towels provided. Fantastic location, clean and quiet - close to shopping, restaurants, beach and activities! Wow, I don't know where to start. The whole building is very well maintained. It's a great location. We walked to grocery shopping, and all but one restaurant. We only used the car twice our whole vacation. I loved getting up in the morning and seeing the ocean view from the patio door as I walked out of the bedroom each morning. We would go for a 2 mile walk on the boardwalk and beach each morning and then make breakfast afterwards and eat that on the balcony. This is a very short walk to the beach of which we only spent one day and spent most of the rest of the days at the pool or at John's Pass about 1 mile north. John's pass is an inlet where you can see dolphins and there are shops, restaurants, music and boating activities that you can do or rent. This unit is close to absolutely everything. There's no reason to go anywhere else. Loved it and we'll be back! Thank you Mary Lou for your kind words. It sounds just like what I would write for a review. We just love the area, its location and vibe. It really does have something for everyone. We hope to have you again in the future! The coins centrally located in Treasure Island and is convenient to shopping and restaurants. The property is well-maintained and the staff is very friendly and helpful. 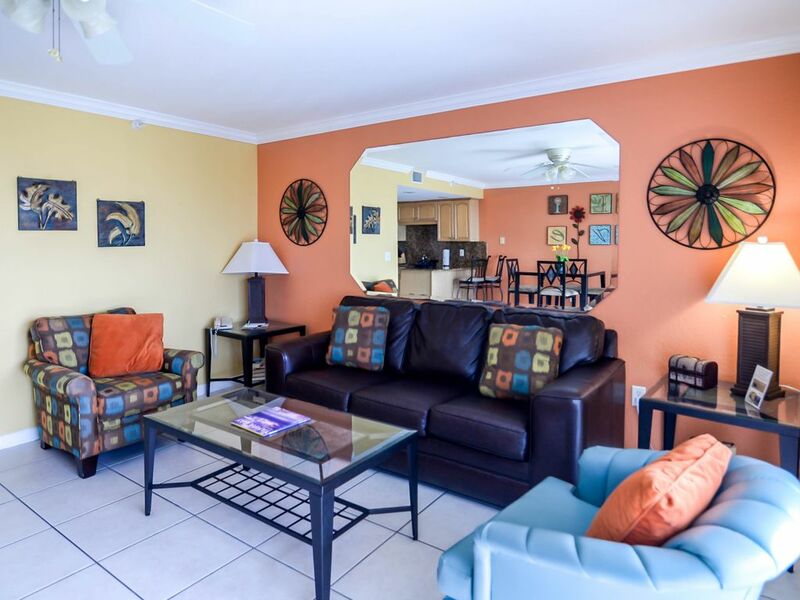 The condo is has everything you need for a comfortable stay. It is extremely clean and the view from the balcony is gorgeous. Definitely will be back. Its such a treat to have you and your husband back. This might be close to your 5th trip here. I am happy that our condo remains your go to place when you need to rewind and I look forward to having you back again! Will share your compliments with the front desk staff! Awesome location and breathtaking sunsets! Great spot on the beach. Friendly staff to assist. Nice pool. Boardwalk right outside the door and beautiful view of the beach! Super cool sunsets right off the deck!! Thank you John for the nice review. I cant believe that you did not mention your fishing trip! Thats one of our favorite past times and I know it is yours as well. It doesn't get much better than a fresh fish dinner. There is nothing more flattering than a repeat guest and it is my pleasure to have you and your family back for the "umteenth" time! I look forward to talking with you next year and seeing more fish pics! St Petersburg gulf coast during Spring Break. Pretty crowded, but that was our choice. The weather was great. The place has a king bed, laundry and dishwater, good TV and a nice balcony with as good a view as you can get on Treasure Island. The staff was very helpful. Very family friendly. Yes Florida can be quite busy during spring break. It is nice that you and your family enjoyed it together. I appreciate you taking the time to write a review and share your thoughts. Hopefully this means a return trip in the future. This was a perfect place for our vacation. As other have said, we did not want to leave. Front office staff were so very friendly and answered any questions. Loved the balcony views, proximity to the beach and to the Treasure Island walk. Perfect for our needs and felt like a home away from home. Makes me so happy to hear this. We too, feel the same way and never want to go back to reality. So happy that you had a great time and we hope that you will come stay again real soon! Keep my number handy! My husband and I stayed for a week . The apartment was clean and bright. We had some toilet issues and washer issues when we arrived. But, they were addressed immediately. The Staff and people that manage the apartment were very helpful and I would go there again. I am so happy that you enjoyed your stay and would consider returning. From speaking with you it sounded like you had a nice time exploring downtown St. Pete and the museums. We have enjoyed the many activities there as well. I cant imagine that someone would not notice a large medicine bottle top floating in the toilet! I am so sorry for the inconvenience this caused you and am pleased that both items were taken care of quickly by the front desk staff. As an owner you hope these sort of things never happen. Having the staff on site sure does take the worry away for the owner because I know our guests will be taken care of quickly. I look forward to hearing from you again and thank you for taking the time to review our condo. Minimum stays requires during Holidays. Sat-Sat rental only in Feb- Apr.